Join Art House Centro for an opening reception for the work of Tom Baumgartner and Mykl Wells. 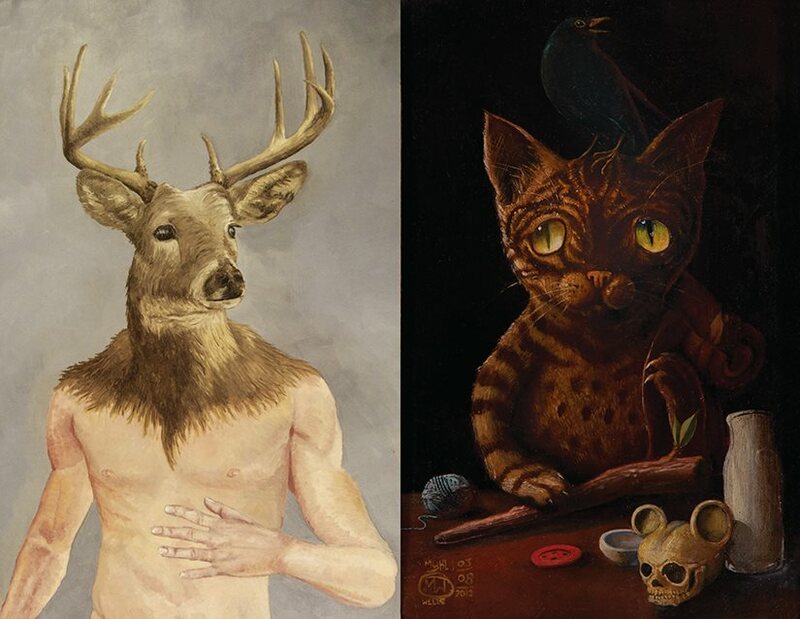 Opening Reception: January 11th 7-9 pm Regular Gallery Hours: January 11th-February 1, Mon-Sat 10-5:30 Sun 11 to 5 Tom Baumgartner's paintings are recent explorations of therianthropy, or mythical hybrids of humans with animal heads. Baumgartner is inspired by 19th century naturalists, their illustrations, and romantic approach to writing about nature. His works evoke a sense of awe and wonder missing from modern science. Mykl Wells’ oil paintings of kittens, bunnies and internal organs are reminiscent of little golden books, wed with a neurosurgery journal. Overtly mining childhood landscapes and mythologies, the subject matter is both irreverent and philosophical.